David Laid is a bodybuilder and fitness expert from the Northern European country of Estonia. His expertise in this chosen field of endeavor has earned him much prominence across various social media platforms. He has amassed well over one million followers on Instagram as well as over 850,000 YouTube subscribers and can thus be described as a bonafide social media celebrity. Beyond the fact that he is a fitness expert and social media personality, David Laid is also a model and his massive social media following has equally fetched him several endorsement deals. David Laid was born on the 29th day of January 1998 in Estonia. His mother Nino was originally from Russia. His father died in an accident when he was still a toddler and consequently, his mother moved to the US in search of a better life alongside David and his younger brothers. The family settled in Atlantic City in the state of New Jersey where he schooled at Mainland Regional High School. Laid was very tall and lean during his teenage years resulting from a rapid growth spurt. His gangly physique made him a target for bullies and this eventually took a toll on his self-esteem. To make matters worse, Laid was also diagnosed with scoliosis, a medical condition which resulted in a sideways curvature of his spine. He received medical advice to start weight training with a physical therapist in order to avoid the severe consequences of the condition. He was also motivated by the possibility of gaining more muscle mass and thus getting rid of his not-so-favorable thin physique. The weight training worked out perfectly and this made him very passionate about it and he eventually quit every other sport he participated in to concentrate on it. While trying to get his body in shape, David Laid also sought for online body transformation videos to help him in his physical training and he was inspired by fitness icons like the “Hodge twins,” Marc Fitt and Jeff Seid. He was also inspired to document his own journey to the ultimate body goal just like the above-mentioned fitness icons. Indeed Laid’s body transformation is nothing short of amazing. From a pale kid whose hockey coach once called “chicken legs,” he has become a global fitness sensation who is greatly admired by fellow fitness enthusiasts across the world. From the teenage boy who was too shy to wear a bathing suit to the self-confident fitness model who loves to show off his insane body. Beyond his individual accomplishments, David Laid has also recorded collaborations with other well-known fitness icons. 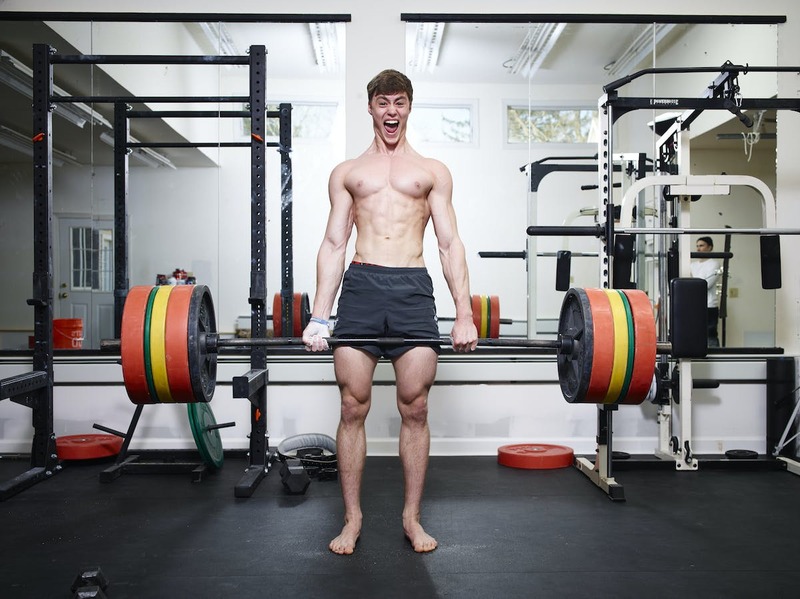 Bodybuilding and fitness was just a means to an end for David Laid, but it has now become a way of life and a fulltime career for the talented internet star. David Laid stands at an impressive height of 6 feet 2 inches (188 cm). His well-sculpted physique is undoubtedly his trademark feature and he keeps his body weight within the range of 185 – 195 lb (84 – 88.5 kg). The fitness expert owes his enviable physique to several years of hard work coupled with an incredible work ethic. He is known to engage in different kinds of workouts but his favorites are deadlifts, bench press, and squats. He also exercises 6 days every week as much as 6 hours on each day. As revealed by the fitness expert, he does not like food so much and thus he has to put in extra effort in order to meet his daily calorie requirements. There have been several speculations over the years on whether Laid uses performance-enhancing drugs like steroids to aid his bodybuilding. However, the multitalented Instagram star insists that he is committed to growing his body through natural means only. I guess we all have to take his word for it.